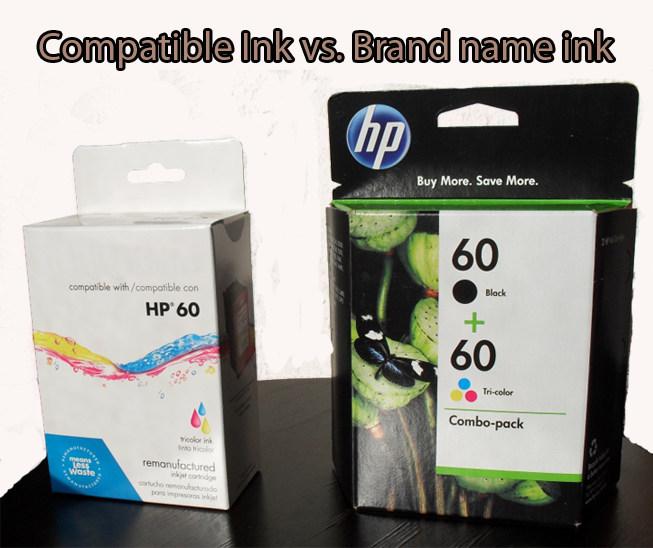 Brand Name Cartridges Vs Compatible Printer Cartridges: How to choose? Should you use brand name (a.k.a. OEM cartridges) or compatible cartridges? How does a compatible or re-manufactured ink or toner cartridge compare with its OEM (brand name) counterpart with regards to quality, cost, and results? These questions can be very confusing to many who may not understand the process and make it difficult to decide. Compatible ink cartridges can damage your printer? Original Equipment Manufacturers (OEM) warn consumers against buying compatible ink and toner cartridges, claiming that “fake” cartridges can damage the printer and are poor in quality. They insist on only using “genuine” cartridges since they are made specifically for a given printer’s make and model. In fact, compatible cartridges are also made to suit the specifications of the same printers, hence the name “compatible.” Ultimately, they are as safe to sue as any brand name cartridge. Recycled cartridges offer the same printing quality? Since compatible toner and ink cartridges are made to fit the specifications of their complementary printers, the results are parallel with the OEM brands. Buyers are particularly concerned about the print quality of re-manufactured cartridges, because they are made from recycled material. However, when cartridges are re-manufactured, each part is examined for integrity before it is reused. As long as you buy from highly reputed sellers; such as CompAndSave.com, the print quality and results will be as good as a brand name printer cartridge. The main difference between OEM and compatible cartridges is cost. You can save up to 90% if you purchase a re-manufactured brand rather than the brand name one. Merchants often price their printers low, while inflating the price of their cartridges. As a result, the main source of profit for many equipment manufacturers is the cartridges and not the printer itself. Compatible Cartridges don’t void Printer Warranty! Another concern people have about using compatibles is the voiding of the printer warranty. There is the misconception that if you don’t use brand name cartridges, the printer warranty will be voided. However, The Magnuson–Moss Warranty Act, which governs warranties on consumer products, mandates that sellers of consumer goods who make service contracts on their products are prohibited under this act from disclaiming or limiting implied warranties. There are exceptions to the law, but in general an original equipment manufacturer cannot refuse to honor the warranty simply because the buyer chose to use it with a compatible brand. Since OEM cartridges are made using brand new parts, this has a significant environmental impact in terms of raw materials and energy used in the manufacturing process. On the other hand, generic cartridges are made by recycling used or exhausted toner or ink cartridges. The entire re-manufacturing process is oriented towards preventing used cartridges from polluting landfills and creating an environmental hazard. Therefore, using re-manufactured cartridges has a positive impact on the environment by reducing contamination. So, in regards to quality, cost efficiency, and environmental impact, it makes more sense to use compatible ink cartridges rather than their brand name counterparts. For special deals on compatible ink & toner cartridges subscribe to our mailing list and follow us on Facebook.